Have you taken a good hard look at the dairy case lately? If it’s a lot bigger than you remember, it’s likely because yogurt has commandeered much of the space. With so many flavors and varieties to choose from, it can be tricky to figure out what to buy. Yogurt is probably one of the oldest foods around. The word yogurt is Turkish in origin, and it’s thought that it dates back to the Neolithic people of Central Asia around 6000 B.C. Yogurt was actually “discovered” accidentally: herdsman would carry milk in animal stomachs. The enzymes from the stomachs curdled the milk, turning it into what we know today as yogurt. Turkish immigrants brought yogurt to North American in the 1700s but it really caught on in the 1940s when the son of the Danone company founder started a small yogurt factory in the Bronx. We now know this company now as Dannon. Protein and magnesium are two key nutrients for diabetes management. Protein provides a feeling of fullness and can even out blood sugar levels. 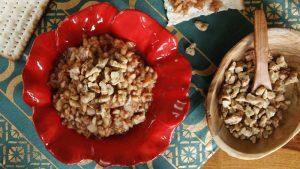 Magnesium helps improve insulin sensitivity, which can also help improve blood sugar levels. 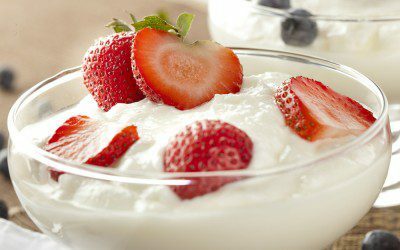 Along with the above nutrients, yogurt contains probiotics, also known as “good” bacteria. While more research is needed, evidence points to these friendly bacteria as helping to boost the immune system, improving digestion, preventing urinary tract infections, and easing certain skin conditions, such as eczema. Sugar: While yogurt seems to be bursting with nutrition, some types of yogurt contain ingredients that aren’t so healthful. Many yogurts on the market today are full of some type of added sugar, including sucrose, high-fructose corn syrup, honey, maple syrup, and fruit juice. Yogurt naturally contains sugar from milk (called lactose), but food manufactures often add extra sweetness, turning a healthful food into a high-calorie sugar bomb. Nonnutritive sweeteners: Light-style or no-sugar-added yogurts contain one or more nonnutritive sweeteners, such as aspartame, acesulfame potassium, or stevia. These sweeteners aren’t necessarily a bad thing, but if you prefer to avoid them, it’s important to check out the ingredient list before you buy. Fat: Yogurts vary in their fat content, based on the type of milk used. Some yogurts are made with whole milk, which provides a rich, creamy flavor. Nonfat yogurts are made with nonfat milk. And low-fat yogurts are made with 1% or 2% milk. The good news is that some research indicates that whole milk may not be all that bad for us. The not-so-good news is that some health experts are still skeptical and recommend limiting whole-milk products due to its high saturated fat content. Colorings and fillers: Some brands of yogurt contain coloring (to make the yogurt look pretty), along with gelatin, modified food starch, pectin, inulin (a type of fiber) and carrageenan. Again, these ingredients aren’t necessarily harmful, but if you’re more of a purist when it comes to food, pay close attention to that ingredient list. Look for a seal on the container that reads, “Live & Active Cultures.” This ensures that the yogurt contains probiotics. Bypass yogurt that lists sugar as the first or second ingredient. Skip the flavored or fruited yogurt (which may not even contain real fruit). Instead, buy plain or vanilla yogurt and add your own fresh fruit. • At least 5 grams of protein per serving. • Less than 1.5 grams of saturated fat per serving. • At least 20% of the daily value for calcium and 10% of the daily value for vitamin D.
• No more than 10 grams of added sugar per serving (keep in mind that all yogurt contains, on average, about 15 grams of natural sugar per serving). If you’re looking for more protein, choose a Greek-style yogurt or skyr, which is an Icelandic yogurt that is milder than regular yogurt, but also high in protein. Again, watch out for Greek yogurt with a lot of added sugar. Going with plain is always your best bet. Can bread be part of a diabetic diet? And, if so, how do you choose the type of bread that’s best? Bookmark DiabetesSelfManagement.com and tune in tomorrow to find out from Regina Shirley, a registered dietitian with Type 1 diabetes.